Because promotional products are custom imprinted with your company logo, many of our products are sold with a minimum order quantity. 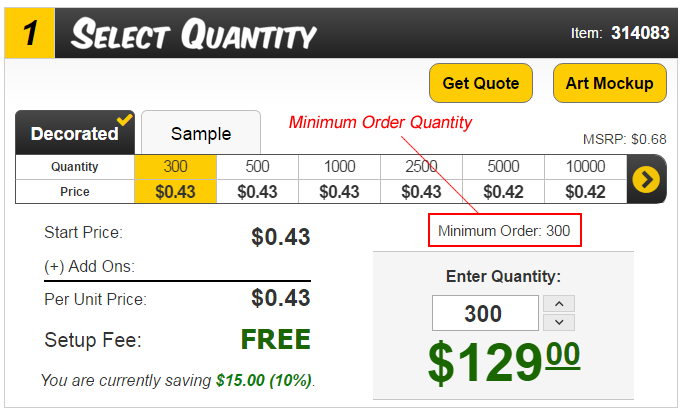 This means that the minimum quantity specified must be met in order add the order to your cart. Plastic pens, for instance, have a minimum order quantity of 150 or 300. Our minimum order quantities are displayed very clearly in multiple areas on each product page. Have additional questions about our minimum order quantities policy? Contact one of our friendly customer service representatives today!